Identical twins Michal and Merav Mor have more than looks in common: both earned PhDs in physiology at Ben-Gurion University, both compete in triathlons, both are health researchers and mothers. Wanting to manage their nutrition scientifically, the Mor sisters came across a metric called respiratory quotient (RQ), the ratio of carbon dioxide (CO2) to oxygen (O2) in the breath. Measuring RQ after sleeping, eating or working out reveals whether the body is producing energy from fat or carbohydrates. Hospitals and clinics worldwide offer RQ measurement to help athletes adjust diet and activity for peak levels of fitness. However, the process involves sophisticated equipment, professional analysis of results and an hour’s worth of time – not something that could be done at home or on a daily basis. Lumen, the company cofounded by the Mor sisters and three partners in January 2014, is launching a neat little device that works with an app to analyze breath within seconds and provide a personalized RQ along with suggestions to help you lose weight and optimize workouts. “You may think you have a fast or slow metabolism, but it changes every day based on what you eat, how much you sleep and if you work out,” says Lumen cofounder and CPMO Dror Ceder. 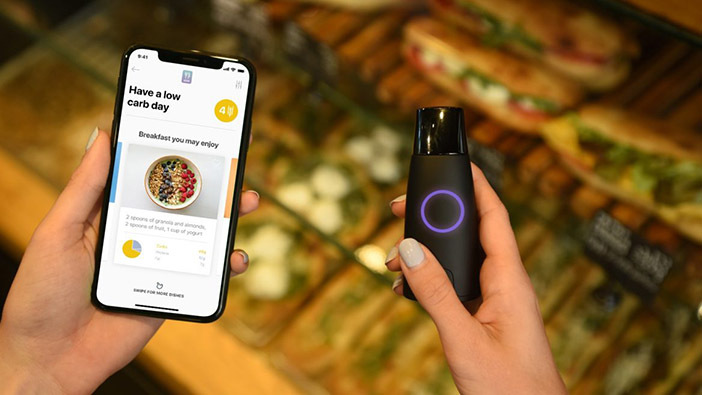 Because burning carbs produces more C02 than burning fat, the sensors inside Lumen measure the concentration of CO2 in your breath to reveal where your cells are sourcing their energy. Lumen (the name signifies the way it illuminates what’s happening in your body) has several years of research, development and testing behind it. The Mor sisters took their idea of a quick, at-home automated RQ test to Michal’s husband, Daniel Tal, and his business partners Dror Ceder and Avi Smila. The three entrepreneurs had worked together for 14 years. Their second startup, Wibiya, was sold to Conduit for $45 million in 2011. By the end of 2013 they were looking for their next challenge. Ceder recalls with a laugh that they “naively jumped into” the Lumen project. Ceder says some other startups are testing a different breath biomarker to measure fat-burning but he does not see them as competitors. Firstly, Lumen researchers found issues with that particular biomarker, and secondly these companies don’t have the companion app with actionable insights, he claims. 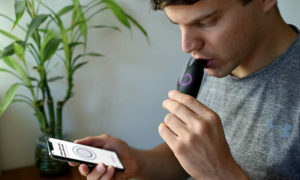 The Tel Aviv-based Lumen opened an office in New York and gave the beta device (designed by the Milan branch of industrial design house Frog) to more than 300 New Yorkers to try in September 2017, following initial validation studies completed at several prominent hospitals and universities. Lumen was tweaked many times based on the beta users’ reactions. External validation studies at San Francisco State University and Tel Aviv Medical Center, among other places, proved Lumen reached results equivalent to current gold-standard RQ measurement. “We are still iterating and will continue to do so for the life of the company,” Ceder tells ISRAEL21c. Following an Indiegogo crowdfunding campaign whose $50,000 goal was far surpassed, breaking the $1 million mark, the company expects to start shipping Lumen in February (US) and March (international) 2019. Early adopters are getting Lumen for well below its $299 retail price. Now that a tool will be available to the masses, how can users be encouraged to change their behavior based on the data it reveals?